A while ago I commented on the discovery, by a man flying a model aircraft equipped with a camera, of a “river of blood” behind the Columbia Packing Company, a Dallas, Texas meatpacking plant. I was interested that the immediate public reaction, in some forums, seemed to be not “What is that river of blood doing there?” but “Wasn’t that photo a violation of the packing company’s privacy rights?” I felt that that kind of attitude could make it difficult for anyone to document anything — including animal rights violations — which happened to be taking place on private property. Recently, a South Carolina animal rights group with the acronym S.H.A.R.K. sent a reconnaissance helicopter over a group of hunters who were, on private property (Broxton Bridge Plantation), having a “pigeon (or dove) hunt” (according to them — probably one of these) or a “pigeon shoot” (according to S.H.A.R.K.). S.H.A.R.K. planned to shoot video of the event. Of course, the hunters promptly shot down the drone. Ironically, both the pigeon hunt and the drone launch in this case were apparently perfectly legal. The shooting of the drone might or might not also be legal, but neither it nor the launching of the helicopter was probably the most enlightened way to make the feuding parties’ respective points. On the topic of becoming the other I found interesting a small pencil triptych of his entitled the Shamanism Series. The three images each feature dangling animal carcasses above lovingly rendered, disembodied, animal heads; the carcasses are interspersed with hanging, headless, male human torsos, strung up by one leg as if presented, along with the carcasses of the animals, for sale and consumption. As you move through the triptych the carcasses do not significantly change in detail, but the heads do. In the first image the heads are all animal (although there is one human foot present); in the second, there are two adult male heads with eyes closed; and in the third, three infantile human heads stare wide-eyed directly at the viewer. Over the course of the viewing one is more and more directly confronted with the idea of humans as carcasses, humans as meat, humans as nothing more (or less) than the animals pictured around them. What interests me most about this series of images is that, in endeavoring to transmit to the viewer the idea of humans as meat, the artist cannot bring himself to actually picture the humans as meat. The animal carcasses are skinned, gutted, dismembered; the humans are missing only their heads, and occasionally their off legs. They have not had their internal organs or skin removed; they have not had their hands and feet cut off; they are certainly not shredded like some of the animal parts. They are not strung up by a hook under the Achilles tendon as are real meat animal carcasses, but instead suspended via ropes around the ankle. The animals are as meat as it is possible to get; the humans are still very human-shaped. I’m probably missing some deep symbolism here, and perhaps the art is about something entirely other (try as I might, I cannot find an artist commentary for the images). Maybe it was just very, very difficult to find artist’s models for gutted human torsos (and that is a good thing). Maybe properly dressed human carcasses did not look human enough to be identifiable, and did not completely make the artist’s point. 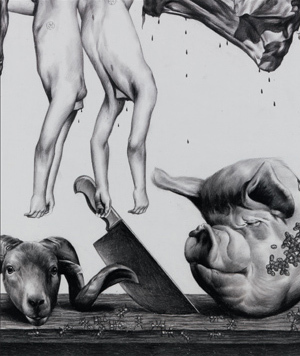 However, it really does interest me that in a series of images seemingly devoted to humans becoming the other, becoming the meat animals we consume, the artist could not quite bring himself to completely depict humans as meat.